Posted on 08/11/2010 by Eric Britton Tagged * Parking2010AuthorCity cyclingContributorsPublic transportSprawlWatching Briefs	Comments9 Comments on Locked in Suburbia: Is there life after Autopia? Locked in Suburbia: Is there life after Autopia? Something like ten percent of our lonely planet’s population are today thoroughly locked in — or at least think they are — to an “automotive life style”. While in barely two generations the earth’s population has tripled, the automotive age has, step by silent surreptitious step, changed the way we live — and in the process made us prisoners of just that technology that was supposed to make us free forever. That’s a bad joke and bad news. But there is worse yet, and it comes in two ugly bites. For starters, in addition to the ten percent of us already hapless prisoners of our cars, another twenty percent of our soon seven billion brothers and sisters are standing in line eagerly in the hope of getting locked in as quickly as possible. And as if that were not bad enough, the consensus among most of the experts and policy makers is that our goose is forever cooked, and there is little anybody can do about it. Well, maybe not. Spend some time this Monday morning with Paul Mees, as he attacks this received belief and suggests . . . Well, why don’t I just get out of the way and let Paul speak for himself. This book is for people concerned about the environmental and social costs of automobile-dominated cities. There are plenty of books that outline these costs, and the other reasons for moving beyond the automobile age, but few that offer practical suggestions about how the move can be made. We need alternatives to the car, and we need them now, because problems like climate change and insecure oil supplies are urgent. Europeans can manage it, but we can’t. And the task seems impossible in the spread-out suburbs and ex-urbs where most population growth is taking place. many times their current densities; nor do we need a fundamental transformation in human consciousness, however desirable that might be for other reasons. The high-quality public transport found in places like Switzerland has been adapted to serve the existing urban environment, and a population that shares our faults and failings. planning and politics, the same factors behind public transport failures across much of the English-speaking world. The idea that compact cities, or consciousness-raising, or the free market can provide a substitute for getting policies and planning right has been widespread across the ‘Anglosphere’ for at least two decades. The results have not been promising. It’s time for a new approach: this book outlines that approach and the grounds we have for believing it can work. In putting these ideas together, I have had the assistance of a great many people, too many to name. But I do want to mention some. . . .
and competent public administration. These things do not come about by accident; they require an active, informed community that demands high standards from its politicians and bureaucrats, and insists that policies be based on evidence rather than spin. The truth really does matter, no matter how upsetting it is to the powers that be. anniversary in 2008. Since the passage of its enabling legislation in 1958, Monash University has educated over 200,000 students at its campus in suburban Clayton, granting degrees in disciplines ranging from medicine to literature. But regardless of their academic discipline, most Monash students over the half-century have been educated in one unofficial common subject. This subject could be called Public Transport 101, and it has been offered continuously since the Clayton campus opened on 11 March 1961.
is named, spent much of his early career building railways. In military and civilian life, Monash demanded the highest standards of planning, organization and delivery. He might not have been impressed had he tried to reach the university named after him by public transport. To do so, one takes a suburban train to Huntingdale Station, some 17km from the city centre. From there, the campus is just over 2km away by privately operated bus. the students taking Public Transport 101.
plenty of time to reach campus for the first lectures at 9:00 am. The Clayton campus is home to 32,000 staff and students, and even though most drive, that still means around 200 alight from the train. They must queue to leave the station, as the single exit is a narrow ramp, leading to a cramped subway. Passengers emerge into the station car park, which must be crossed in the open. It’s raining, so they cop the full force of the weather. still waiting, as a long queue of passengers from the previous train boards, one by one, each required to insert a ticket into a validating machine. Eventually the bus departs, ten minutes late and packed to the gunwales, leaving dozens of passengers behind. They are joined by those from the 8:40 train. As the shelter at the stop only holds five people, everyone else waits in the rain; some take refuge among cars parked in the undercroft of a nearby factory. The 8:46 bus arrives and eventually leaves, full, at 9. The last passengers from the 8:40 train reach Monash University at half past nine. bus and train timetables are not co-ordinated, waits can be up to half an hour. The main bus stop is in a laneway between the blank concrete wall of a road overpass and the blank brick wall of a factory. Students are understandably afraid to wait there after dark. from the top of the escalators serving the station platform. As explained in Chapter 6, there are no delays from ticket checking as the bus terminal is inside the station fare gates. The Toronto Transit Commission is currently planning to extend the rail line to York University. that in other respects was so similar. ‘How long has this been going on?’ she asked me. The answer is: since Monash opened in 1961. For many years, the main bus route and the train service both ran every half-hour during the evening: as the bus actually ran in the evening, it was regarded as good by Melbourne standards. Each bus reached the station two minutes after the corresponding train left, ensuring a 28-minute wait for the next train – which was even helpfully shown on the timetable. This continued until 1990, when the bus company, citing low demand, scrapped most evening services. complaints about Melbourne’s privatized, but state-subsidized, public transport. Smart Buses provide the very best Melbourne has to offer: they even run seven days a week – which is handy because the Monash library is open every day, including Sunday. The new Smart Bus ran every half hour on Sunday mornings, just like the train, with buses departing Huntingdale at 4 and 34 minutes past the hour. As trains reached the station at 7 and 37 past the hour, each bus missed the nearest train by three minutes. After 7 pm, trains arrived three minutes earlier – at exactly the time the buses left. Since even an Olympic sprinter would take two minutes to reach the bus stop from the station, all this ensured was that passengers could view the departing bus from the station platform, before waiting half an hour for the next one. presentation for the Australian Government’s Garnaut Climate Change Review. So what have 200,000 Monash graduates learned in Public Transport 101? a constant subject of on-campus discussion. carbon emissions, including those from transport.2 Monash students take courses on climate change, insecure oil supplies and other constraints on a car-dominated future. They learn that a sudden interruption to supplies of affordable oil, or a serious attempt to reduce carbon emissions from transport, would cripple the university and the metropolis of Melbourne. Some of the more curious ask why their city and campus are not better prepared for the future. Why has public transport to campus been so hopeless for so many years, and why is nothing being done about it? density is the major cause of automobile dependence, so public transport problems can’t be fixed until Melburnians abandon their separate houses and backyards, and begin living in apartments like Europeans. another 15 minutes by bus up the hairpin bends of the Sternenberg-Strasse. an hour every day of the year, from 6:00 am to midnight, with an hourly all-night bus service on Fridays and Saturdays. Of course, if Sternenberg was in Australia or the UK it would have no public transport at all, and Bauma would be lucky to see a bus a day. and seven on summer Sundays and holidays. Each Sunday bus leaves from outside Bauma station at 24 minutes past the hour, connecting with trains arriving at 20 past the hour. The bus calls at the church, dropping off hikers, then does a circuit of the main hamlets collecting locals before returning to Bauma to connect with an outward train. Once they board the bus, residents of Sternenberg don’t need to worry about timetables. Each bus meets the train at Bauma, which in turn connects at the regional hub of Winterthur with another train to Zürich, as well as departures to Zürich Airport and major centres across the canton. Each of these trains is met by connecting bus services at stations en route, providing access to every place with more than 300 residents or jobs. occurring mainly in suburban and rural areas. Only 14 per cent of Sternenbergers took public transport to work in 1990. The shift away from the car that Zürich City achieved in the 1980s is now being repeated, admittedly on a more modest scale, in the rest of the canton. the hikers could keep coming. could not possibly hold lessons for Australia. creative. Planners ‘own’ city design; transport means working with engineers and economists, who are much better at maths than us. Urban design is what we do; transport planning is what other people do. suburban residents rather than public transport providers. that the funds would be better spent tackling Canberra’s woeful public transport. decades, and may be politically impossible in a democratic society. terrain of rural towns and villages like Bauma and Sternenberg. actually be entrenching the problem they are trying to solve. solutions are not backed by solid evidence of effectiveness. found only in dense city centres is being extended to suburbs and even rural areas. for low-density urban areas is emerging, with evidence of effectiveness to back it. people, hating the suburbs has become a kind of moral crusade. required to bring it about. also required; hence this book. light on transport policy questions. The tradition was pioneered in 1977 with J.
remains a classic, and his observations are as relevant today as three decades ago. back theirs, but as will be seen, there are also some key differences. transport service quality, but I am not suggesting that urban form has no influence. transport, and will fail if they are pursued on their own. My own attitudes to suburbs and transport have been shaped by my background. Australians live in places like Ramsay Street, the car will be king forever. students, so what you will read is as much the result of their work as mine. environments, a model that will help us move beyond the automobile age. Dr. Paul Mees (born 1961) is an Australian academic, currently serving as a senior lecturer at the school of Global Studies, Social Science and Planning at RMIT University, previously at University of Melbourne, and has been a consultant to local, regional and State government transport and planning agencies in Australia, New Zealand and Canada.. Originally a lawyer prior to becoming an academic, he lectures in statutory planning and transport planning. Paul is a past President of the Public Transport Users Association in Melbourne and has been a very high-profile contributor to public debates on transport planning in Victoria over the last decade. Some of the most notable controversies involving Dr. Mees have been his legal actions attempting to prevent the construction of transport projects contrary to his views on good public transport policy. A very prominent example of this was his attempt during the late 1990s to question the legality of aspects of the largest urban infrastructure project in Australia’s history, the CityLink tollway system in Melbourne. More recently he contested the legality of the project to build a marshalling yard and a new tram “superstop” in front of the main entrance to the University of Melbourne’s Parkville campus on Swanston Street. . You can contact him at paul.mees (at) rmit.edu.au. This entry was posted in *Safe City 2020, 2010, Extra-urban and tagged * Parking, 2010, Author, City cycling, Contributors, Public transport, Sprawl, Watching Briefs. Bookmark the permalink. have taken up with the publisher, I have not yet been able to do this. (and looks a lot easier than) providing similar links for sprawling suburbs. timetables that are not spoilt by traffic congestion. area of the bus between Bauma and Sternenberg (excluding Bauma itself). Similarly the population of the railway corridor between Bauma and Zuerich. support bus services or anything else. Does anyone have anything to offer on this issue ? Thanks for those comments, Simon. The total catchment population for the bus to Sternenberg is 349, as the bus only serves that municipality, which adjoins Bauma. You are certainly right about the weakness of British excuses for not following the example of the Swiss. In fact, Swiss public transport is not especially heavily subsidised. I give some figures in Chapter 7 of the book, which at the exchange rates of two years ago suggest that the subsidy per passenger in Canton Zurich is around 30p, lower than in London or the [former] Metropolitan Counties. I have now read Paul Mees’s book through and am planning to give a “rave” review of it wherever I can. However I do have some criticisms in matters of detail. I think the idea of completely rebuilding our cities at higher densities is a red herring, is anyone seriously proposing that ? The most I think people are saying is that a low carbon transport system would make higher density developments more popular. This is related to an article with the title “The People — What will they wear ?” which appeared in the UK magazine Town & Country Planning and which I reproduced in a local newsletter — see . The theme of this article is that the guidelines imposed by our planning system on where houses can be built are at least as restrictive as guidelines that would mandate a low car ownership society, which would have tackled the pressures for sprawl at their source. I think that Paul is also a bit misleading when he suggests that anti-sprawl measures would be opposed by suburbanites — my experience is that they are at least as virulent in campaigning against further sprawl in the areas where they live as urban dwellers. Jarrett Walker’s proposals for sprawl repair seem worthwhile — I remember that in one of her books Jane Jacobs discussed similar ideas. Incidentally, I’m concerned at the use of the autocentric measure “an hour’s drive” for the distance between Fresno and Yosemite/Kings Canyon National Parks. There should also be good public transport access to these parks. Perhaps people could make day trips to the parks from LA or the Bay Area — I sometimes travel similar distances for days out using only conventional trains and buses. densities) and a layout with strong centres which can, I believe, help to reclaim the surrounding area — especially if they can be made car-free. For example, let’s take a semi-rural area A with 200,000 people, centred on a small city C. Let’s assume that the public transport mode share of A is 3% — not untypical of some of the areas featured in Paul’s book. Let us suppose that a car-free town B, with a population of 10,000, is added, and that this achieves a public transport mode share of 60%. This will of itself then double the demand for public transport. However this isn’t the end of it. The extra services put on to cater for B will attract many existing residents of A. If one assumes an service level elasticity of 0.5 (on a logarithmic measure) then calculations show that there will be a further 30+% increase in transport supply together with a 60+% increase in demand from existing residents. I also think that 0.5 may be an underestimate. Paul’s book shows that if the effect of extra services is to create a network then they can have a very high elasticity figure. Well, the combination of radial services centred on A and B will create a network over quite a wide area around A and B. This explains why I for one get dismayed when every development proposal with which we are presented seems to be “more of the same”. I can point to several developments in my own area which, even without car-freeness, could have added to the connectivity of the local network, but somehow the relevant infrastructure improvements never seem to happen — either the developer weasels out, or while being promised in principle they never seem to materialise — or maybe they will but only when the development has already committed itself to car dependence. Incidentally, Paul refers to a fare elasticity of -0.2 for public transport. This seemed very low to me. Some time ago I came across a paper which suggested that long run fare elasticities could be larger in absolute value than -1 — see page 16, looking in particular at the long range elasticity for buses in the UK, where the mean figure quoted is almost exactly -1. This means that even a small withdrawal of funding (our government is planning changes equivalent to a doubling of the fuel tax currently paid by buses) can have a snowball effect, especially as the government is also planning to restrict the funding available to local authorities to provide support (or to do anything else, for that matter). I should add that our scheme of free travel for pensioners etc. does mitigate the effect of high elasticity somewhat. I think that the result, with a fare elasticity of exactly -1, is that operators can raise their fares in such a way that service cuts are avoided — but what then happens is that every penny the government sought to save is used up in higher reimnbursements to operators (assuming that these are based on a fixed proportion of the fares that would have been paid by the pensioners). 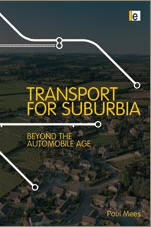 i haven’t read the book, so I can’t comment on it, but thank you for calling my attention to it (Transport for Suburbia: Beyond the Automobile Age). FWIW, the best urban planning book in the U.S. since Jane Jacobs, in my opinion anyway, is Steve Belmont’s _Cities in Full_. It was published in 2002 by the American Planning Association and it didn’t get much press. The first chapter puts numbers to Jane Jacobs’ arguments. The latter chapters focus on the need for recentralization of housing, jobs, and commerce, in order to have a more efficient platform for transit. He distinguishes between monocentric and polycentric transit systems in terms of discussing whether or not transit abets or minimizes sprawl, which is a key issue as it relates to the suburbs, although as is clear from the title of his book, his focus is the center city. As far as sprawl repair goes, it’s easy to repair commercial property, because it can be adaptively reused and is along major transportation corridors for the most part, and it’s almost impossible to “repair” housing tracts–single use subdivisions distantly located from activity centers–that are owner-occupied, except on multiple decade timeframes, and even then it is likely impossible. Even so, there are plenty of opportunities for improvement, and that includes center cities, where suburbanization has been a particular problem over the last 50 years through urban renewal and other automobile centric planning and development paradigms. My focus and primary interest is the center cities although I do deal with suburban issues. It’s hard enough to fix the cities, let alone taking on the battles of the suburbs. So to return to my initial observations, it is worth looking inside the conurbation to see where and then to figure out the many complex reasons as to why, in some areas, car use is much lower than average (by definition) and THEN replicating that set of conditions modified as necessary, elsewhere as the opportunities arise. One of these is lack of car parking … and I must sat that one of the best and in many ways easiest ways around that is to issue more parking permits than there are spaces available … as I understand was done in parts of London some 15-20 years ago. The result? Cars not moved … you can tell by the piles of deciduous leaves around and on them …! For those people, the logical step is to either sell the car or park it remotely where if needed, it can be used. and one of the ways to facilitate this is to come up with neighborhood/district/subdistrict sustainable mob ility plans. In the ped and bike plan I did for a section of Baltimore County, Maryland, I recommended that a sustainable transportation element and procedure and system for creating it, become part of the process of creating community plans. Separately, there is a recommendation for ped and bike plans at the neighborhood/district level. recognize that a lot of stuff in the overall plan was excised between the version I turned in on my last day (of the grant) and what was subsequently posted 6 weeks later. 2. SInce you’re from Australia, I hate to admit that it was just two months ago when I finally read David Engwicht’s book _Reclaiming our Cities and Towns_ which was first published in 1992. It has some searing ideas about what we might call reparations from automobile drivers with regard to their impact on transit and other sustainable transportation modes. … and other amazing points about cities and their purpose of facilitating all forms of exchange while _simultaneously minimizing travel_. The latter point is key as most urban economics texts treat transportation and movement as value free between modes. Imagine overlaying programming plans at this level to work to get people to do more trips by foot and bicycle (1/2 of all trips in the U.S. are 3 miles or less) and transit. Some further comments sparked by recent postings to this group. available demand on almost all routes outside peak times. regional networks are another matter. buildings have off street car parking which will evade the restrictions. matter and it is quite practical to provide it. I do however agree with Richard Layman’s advocacy of sustainable mobility plans. One: the network concept for buses could just as easily apply to bicycles. Bicycle Boulevards are traffic calmed streets with priority for bikes and Peds. Diverters and chokers are used to ensure that past a few blocks autos through traffic is diverted. Besides reusing an existing infrastructure for a higher throughput use, bicycle boulevards on a half mile grid frequency in suburbia can deliver on the same pleasant and efficient standards as networked buses and they get around Mees’ concern with shared bus bike only lanes. Providing bike parking, including tricycle parking for seniors and charging stations for the battery enhanced set and video detection for theft deterrence would at much lower cost provide infrastructure that people may want to use. Marrying it with pricing to ensure network bus throughput at the hub areas, which suffers from auto delays, would change behavior. Solar canopies on the boulevards would ensure that riders were dry in the winter and let the street earn its keep. Three: The problem with transport as Illich notes is speed. A network of slow 15mph streets with associate parking at the hubs would entice neighborhood electric vehicle and NEV shared trips, etc etc. Again existing infrastructure is reused to benefit all road users. These could be green streets with water catchments and permeable surfaces, as these issue are addressed through clean water regulations. Faster scooter, smart, and motorcycle traffic could be restricted with video tickets. Just heard the sad news that Paul died last year.